U.S. stocks mostly stalled near record highs last week amid signs that investors are losing patience awaiting a rebound in corporate profits. After digesting second quarter results, Wall Street analysts now forecast that S&P 500 companies’ earnings may decline by 0.9% in the third quarter. That stands in contrast with a consensus estimate of a 0.8% increase a week ago. Stocks are still up around 9% from their steep two-day selloff following the British vote to leave the European Union. Equities have been buoyed by earnings coming in better than expected and a still dovish outlook on interest rates. In key domestic economic data, retail sales disappointed with an unchanged reading for July, missing forecasts for a 0.4% increase. Housing starts recovered markedly in July, rebounding 2.1%, following a 0.8% June decline. Also positive, the Conference Board’s Index of Leading Economic Indicators rose 0.4%, exceeding economists’ consensus forecast. For the week, the S&P 500 rose +0.06%, the Dow Industrials slipped -0.13%, while MSCI EAFE (developed international) lost -0.58%. The prevailing smaller-than-expected fallout from Brexit has bolstered the global growth outlook, which according to JPMorgan, calls for a return to trend-like 2.6% growth during the second half of the year. This represents expansion about a half a percentage-point above the pace reported in the first half of 2016. 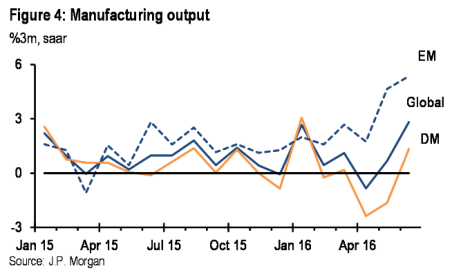 As we see in the chart above, improved industrial production (IP) data in June supports this call, and so far the indications are positive for July. Impending reports from tech-heavy Taiwan and Singapore should also help. The June/July gain in the global Purchasing Manager’s Index (PMI) also sent a positive signal. The global PMI, which already was positioned for 2.25% IP growth in July, is due on September 1. Investors will also watch the U.S. August durable goods report for signs that business equipment spending may start to improve. Lastly, the firming in oil and metals prices this year should spell relief, reducing the pressure on commodity producers while boosting pricing power and corporate earnings more broadly.